In Part 1 of this series, we discussed how U.S. home inventory tumbled to a new record low in the first quarter of 2017, with inventory down 7.1% from this time last year. But when digging deeper by home segmentation, we see that only starter and trade-up homes are experiencing historically low inventory. Now let’s take a look at appreciation values by home segment. Home values have risen dramatically over the last twelve months with the latest report from the National Association of Realtors putting the annual increase in the median existing-home price at 7%. To get an accurate picture of home appreciation in 2016 we need to again, break the numbers down. Starter and trade-up homes, which are most in demand, have appreciated 8.3% in 2016. If you are selling a starter or trade-up home, congratulations, you are in a great position! An accurate market analysis will give you comparisons to ensure your home is listed at the correct price. However before you put the sign in your yard, you need to have your next home all lined-up, as your home is likely to sell very quickly. Finding a starter or trade-up home will remain difficult. There’ll be more competition for the few homes that are on the market, which can lead to bidding wars and homes selling higher than asking price. Visit newly listed homes ASAP and be ready to make an offer the same day. Most importantly be patient and remain flexible! 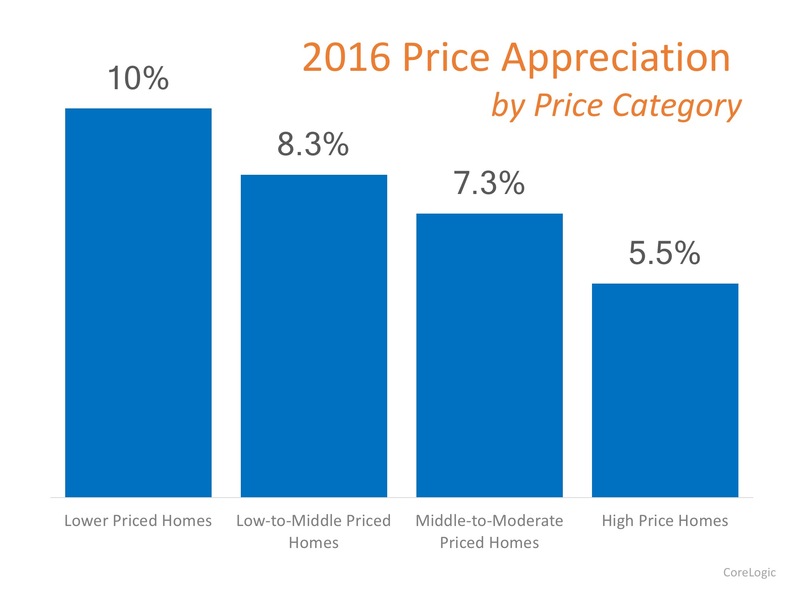 Premium home sellers are not seeing the same appreciation in 2016 as lower priced homes, with an appreciation of 5.5%, however values are continuing to climb. When selling a premium home you need to be conservative and realistic when setting the asking price if you are looking to sell quickly. Buyers of premium homes should be able to negotiate on price and have a much better shot at finding a home with all the requirements. However, the looming interest rate increase will eat away at buying power, so purchasing sooner rather than later is ideal. Analyzing housing data by segment is important because the segments are intertwined. The more premium home prices rise; the more difficult it is for trade-up homeowners to find a premium home that fits their budget. And if trade-up homeowners can’t find a home that fits their budget, they are less likely to sell their existing home. We are in a market where prices and interest rates are projected to continue to climb. As a starter or trade-up home buyer you need to take into account the cost of waiting, as you will pay more for the same house as the year goes on. Give The Garatoni Group a call at 612-821-7456 and we’ll dig into the numbers to help you get the most from your home investment.